Letter from Mrs Bowman, concerning the case of her son. From content, possibly 21st Dec 1787? Concerns her son's teeth as his back teeth are late in cutting. Cullen appears to be suffering from a cold at this time. 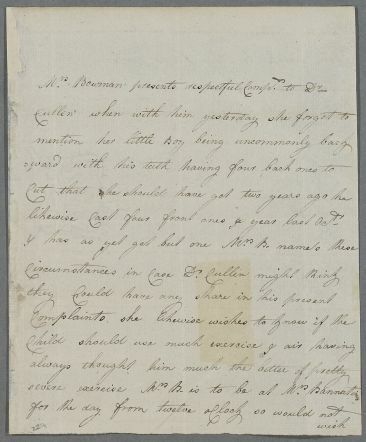 Summary Letter from Mrs Bowman, concerning the case of her son. 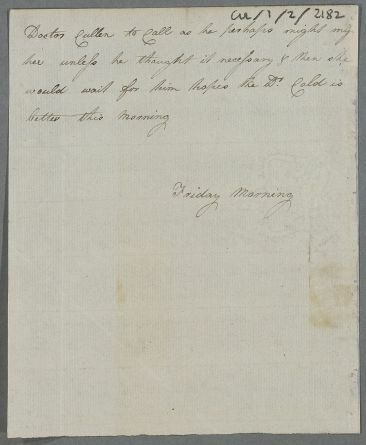 From content, possibly 21st Dec 1787? Concerns her son's teeth as his back teeth are late in cutting. Cullen appears to be suffering from a cold at this time. Case of the son of Mr Bowman who has a history of epilepsy. Mention made of treatment undertaken four years previously but no obvious connection with earlier cases in 1783.